NOTICE PLAYERS IN DRUMHELLER FINALS : APRIL 8TH SATURDAY START IS 10 A.M.
Cory Brummund is the winner of the BCA Photo Contest! This is Cory's reaction after he sunk the 8 ball in the middle of a game! ERO FEAT :: CAN ONLY BE LEGIT WHEN ALL 15 BALLS ARE ON THE TABLE AND IT IS YOUR FIRST APPROACH AT THE TABLE !!! Rocking Out with his Chalk out!! 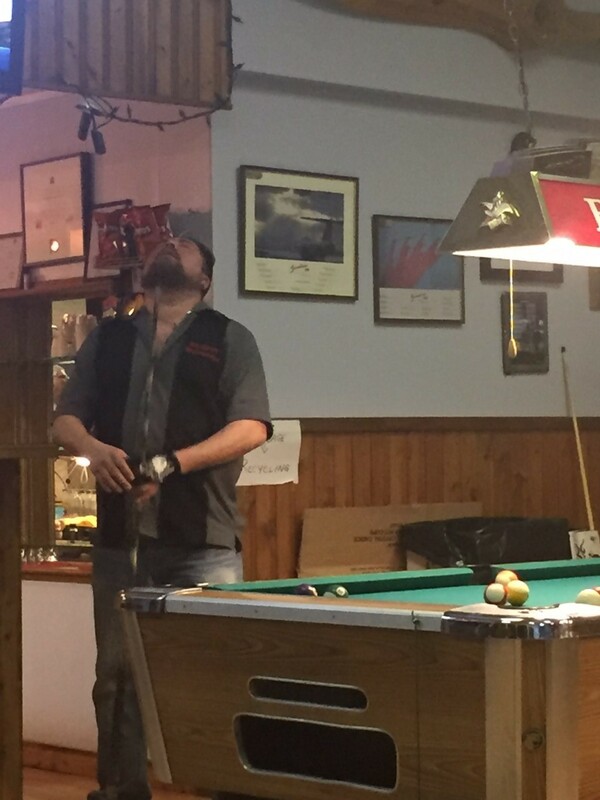 Playing air guitar and sinking eight balls is his specialty!!! He goes by the name "Bradden" to his friends. WITH HEAVY HEARTS WE ANNOUNCE THE PASSING OF REGGIE TREPANIER. 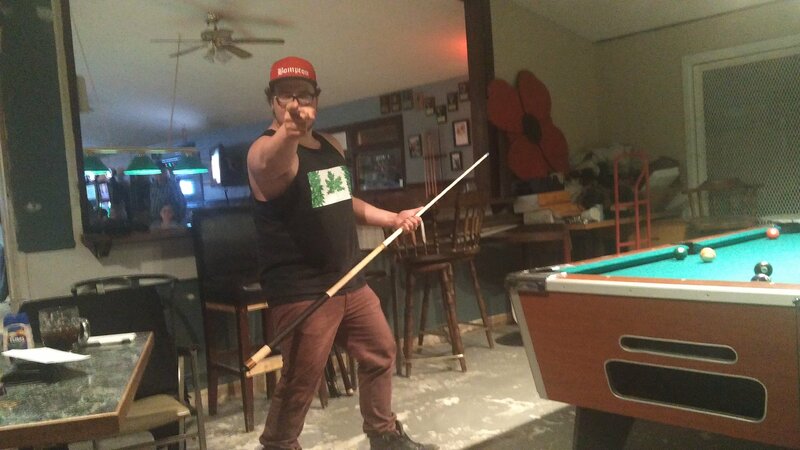 REGGIE PASSED LAST TUESDAY POOL LEAGUE NIGHT IN CARBON. HE WAS LONG TERM POOL LEAGUE PLAYER AND SPARE , HE WILL BE GREATLY MISSED : SERVICE FOR REGGIE WILL BE NEXT TUESDAY AT 11:00 A.M. AT ST. ANTHONY'S CHURCH, LUNCH TO FOLLOW AT CARBON COMMUNITY CENTER . VOTED AT MEETING TO PULL AHEAD THE 3 MATCH DATES AFTER YOUR MAR 31 - APR 2ND TOURNY . THEREFORE YOU MUST COMPLETE ALL MATCHES ON SCHEDULE BY MARCH 28 TH , AND HAVE THEM HANDED INTO HOLLEY AT BOWL BY MARCH 29TH. TRY TO DO DOUBLE HEADERS IF POSSIBLE AS YOU WILL MEET THESE TEAMS MORE THAN ONCE BEFORE SEASON END . VOTE AT MEETING WAS, TO PULL BACK THE LAST TWO MATCHES SCHEDULED FOR AFTER THE APR 7/8/9 TH TOURNY AND PLAY THEM BEFORE THE TOURNY AND HAVE THEM HANDED IN BY APRIL 5TH-2017 SO ALL MATCHES ON SCHEDULE WILL NEED TO BE PLAYED PROIR APR 4TH AND HANDED IN BY APR 5TH-2017 , TO ALLOW FOR MORE PRIZING . THOSE CAPTAINS WHO DID NOT SHOW UP AT MEETING YOUR SANCTION PACKAGES ARE AT MY OFFICE ! IF YOU CHOOSE TO RESCHEDULE THE DEC-27/2017 MATCH .PLEASE LET OTHER TEAM KNOW ASAP. WILL BE USING SAME AVERAGES AS ON THE DEC-20TH MATCHES IF STATS NOT UPDATED PRIOR. ONE OF OF FOUNDING LEAGUE PLAYERS JUST RECENTLY PASSED AWAY. Mr Peter Wolfe . THEY WILL BE A MEMORIAL SERVICE AT CARBON VALLEY HOTEL. SAT DEC-17-2017 AT 3 P.M. NOTE SANCTIONING NOW ACTIVATED IN ALL LEAGUES. IF YOU HAVE NO STATS MUST PAY SANCTION 1ST. IMPORTANT SANCTION CARD INFO: !!!!!! YOU WILL RECEIVE THE NEW STYLE EXPENSIVE HARD PLASTIC SANCTION CARD THIS YEAR FOR SANCTIONING !! KEEP THIS CARD PERMANENTLY FOR FUTURE YEARS OF LEAGUE :IF YOU LOSE THEM CSI WILL CHARGE YOU $ 10.00 USD FOR A REPLACEMENT CARD !!!!!! Posted completely without permission from my team mate, here are a few quick clips from our games last night! !